Jos? Antonio Sorolla was born into a family of extraordinary craftsmen who have passed their craft and skills from one generation to another. For him it was no different. The family business was making pottery and painting it. He first held a brush at 11 yeas old and when school studies let him, he would go to the family workshop to paint. Gradually he learnt the secrets of this ancestral work. For several years he worked here making more important pieces, until one day he discovered oil painting. As Jose says ”I do not know if I did right or wrong, but I did not paint pottery ever again” Instead his career blossomed as a painter, eclectic in his subjects and mediums, as the Spanish say ”?he has always liked to drink from different fountains?. 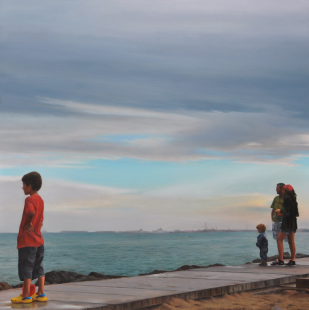 Through the years he has moved through various phases of painting and has exhibited his work across Spain and then Europe, with shows in Italy,Belgium, Germany and the Czech Republic.